Trick or Vote is the nation’s largest get out the vote effort in costume and the GenY Project decided to join the cause. 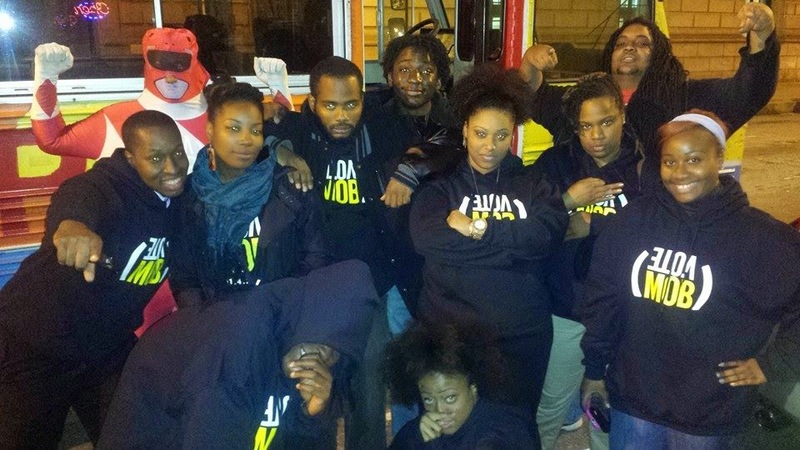 Last night the Gen Y Project got hyped up, filled a bus, and went to the West End to spread the word. Armed with voter pledge cards and candy the group set out to remind the neighborhood why it's important to utilize their right to vote. 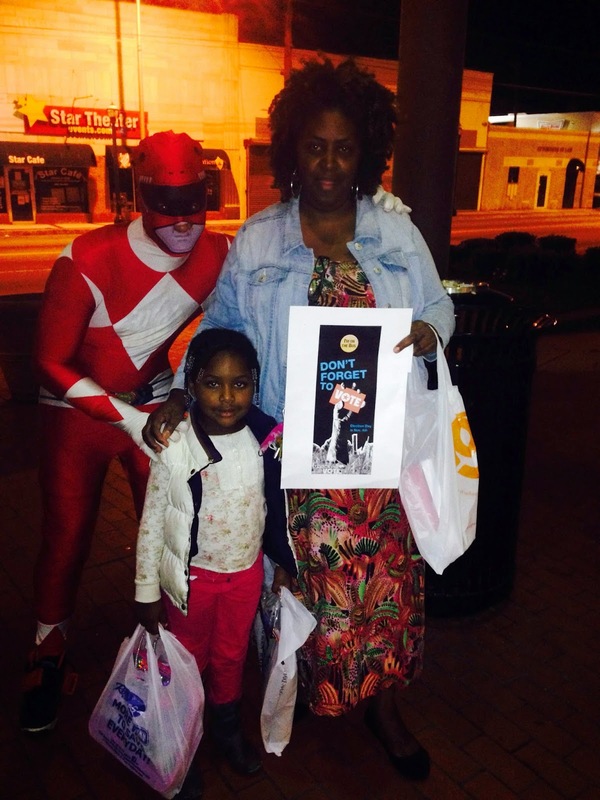 Together we hit the West End Mall and neighboring shops sparking lots of conversation, giving out information, and of course people welcomed the free candy. 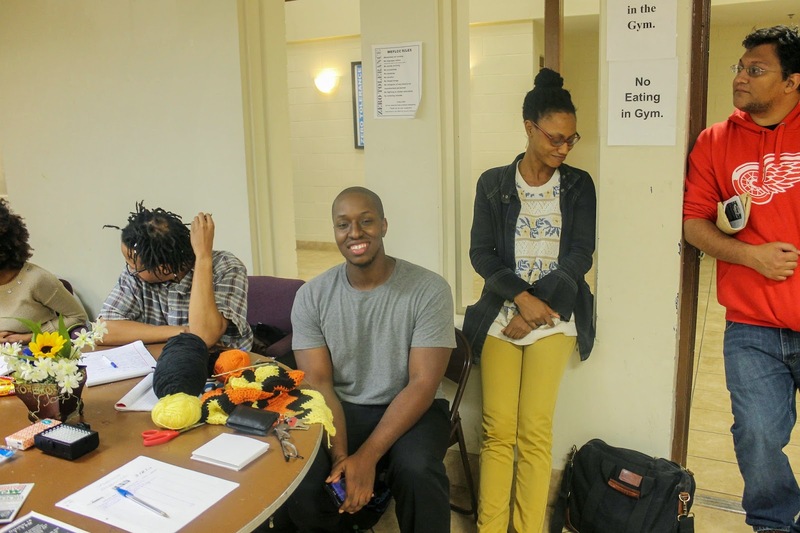 Some had already voted and others were geared up and ready to vote on November 4th. 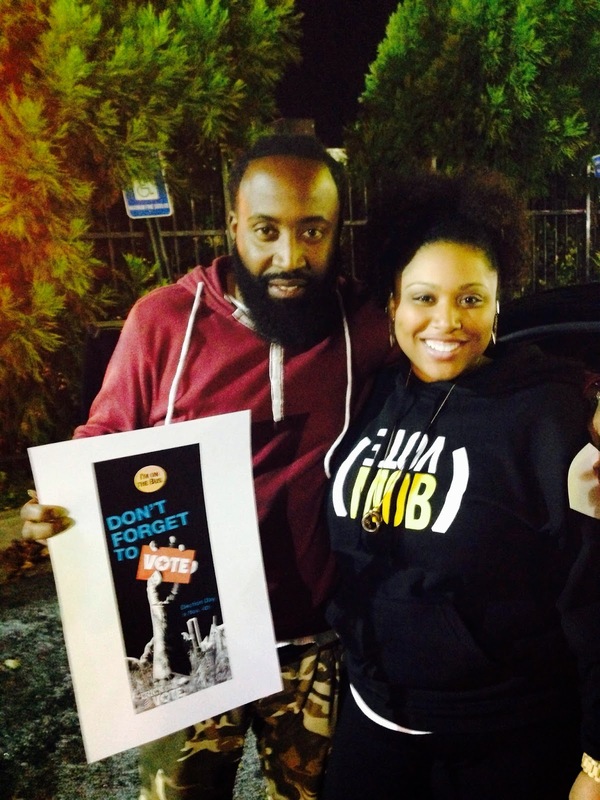 With all the efforts to block young people and black/brown bodies fro the polls in Georgia, getting out and voting is more important than ever. Voting isn't the only thing our communities need to do to change a political landscape that isn't working for a lot of us, but it's an important piece of the puzzle that we only lose when we don't participate. Moral Monday Georgia, along with American Friends Service Committee, Held a Rally and Sit in on this past Monday at the Georgia Capitol in Protest of Clear voter Suppression Tactics by Secretary of State Brian Kemp. Today we learned that the judge presiding over the case has decided not to intervene in the Secretary of State’s work despite the fact that young folks who registered, and have proof that they registered, are missing from the voter polls during an election that has already started. This past year we've seen a historic effort to register new voters in Georgia and change a political landscape that continues to benefit a few people at the cost of everyone else. Right now, weeks after early voting has begun 40k eligible voters have yet to be entered into the voter rolls. 40k is enough to win or lose this election. We know that most of these 40k are young people who have never voted before and come from communities of color. On October 24, 2014 four witnesses were not allowed to testify at the hearing against Brian Kemp's office. All four had registered to vote and are not on voter roll yet. Two of them are young first time voters. We are troubled that you call the lawsuit, "frivolous” This is not frivolity; access to the ballot box is essential to our democracy. 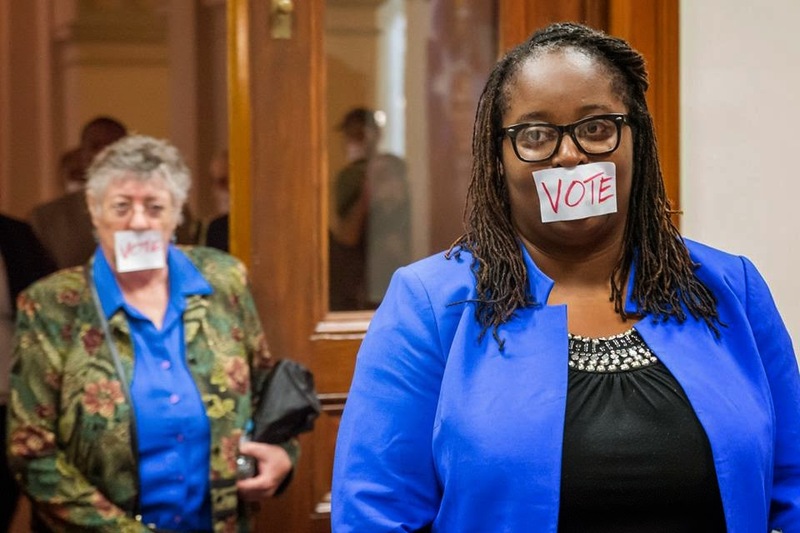 Imagine if you had gone through the trouble of registering to vote and when Election Day came you were told your name was nowhere to be found. We have a simple question: Mr. Secretary – if you have found all of our missing registered voters, where are they? The reality is that the election has begun and already 40k voters have been silenced, shut out of the process. We belief that this is a crisis of democracy, and today some Moral Monday Georgia participants are willing to nonviolently put their freedom on the line to put a spotlight on this crisis. We have decided to remain in your office until this issue is addressed. This means we would like to see every one of the missing registered voters entered into the voter rolls. We believe that in a democracy every voice matters, and we’re counting on you to do the right thing and make sure the promise of democracy in Georgia is realized. 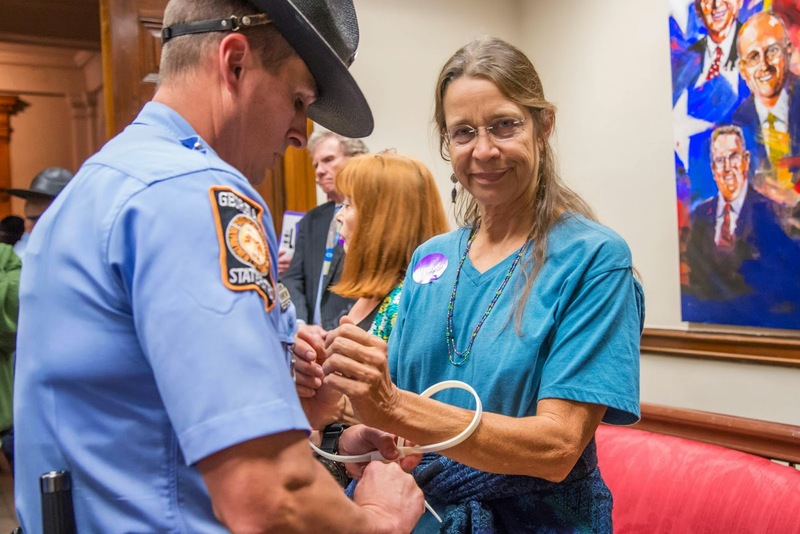 Eight Georgians (Kevin Moran 66, Greg Ames 66, Daniel Hanley 33, Lorraine Fontana 67, Peggy Marx 58, Joel Solow 27, Molly Swann 62, and Kathy Acker 62) were arrested for refusing to leave Kemp’s office until he answered. Ironically they were arrested for disrupting government business. Sadly these days it seems voter suppression is the business of Kemps office, which sits directly across from Governor Deal’s office. Arguably no one stands to gain from blocking young people and communities of color more than Governor Deal who sits several spaces higher on the totem pole above Kemp. Another sad irony is that the reason Kemp wasn’t in the office that day is that he is currently on a GOP Victory tour. We today Governor Deal and Brain Kemp did get a victory, they have successfully built a barrier to the pole for the group of people who are most likely to vote against them. It’s a victory that should not be celebrated. There's a name for this kind of business, we used to call it Jim Crow. 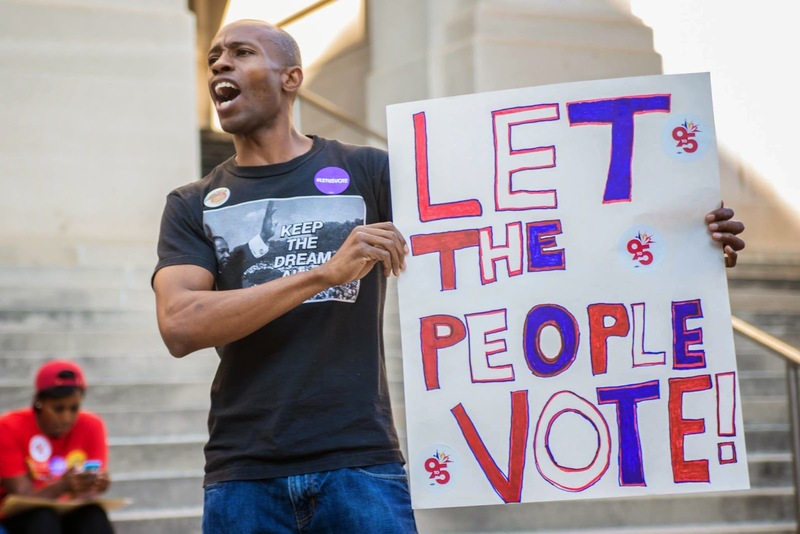 Jim Crow existed to ensure that policies and laws that only benefited some remained by stopping those negatively affected from participating in the democratic process. Jim Crow will forever be synonymous with nasty, mean business. 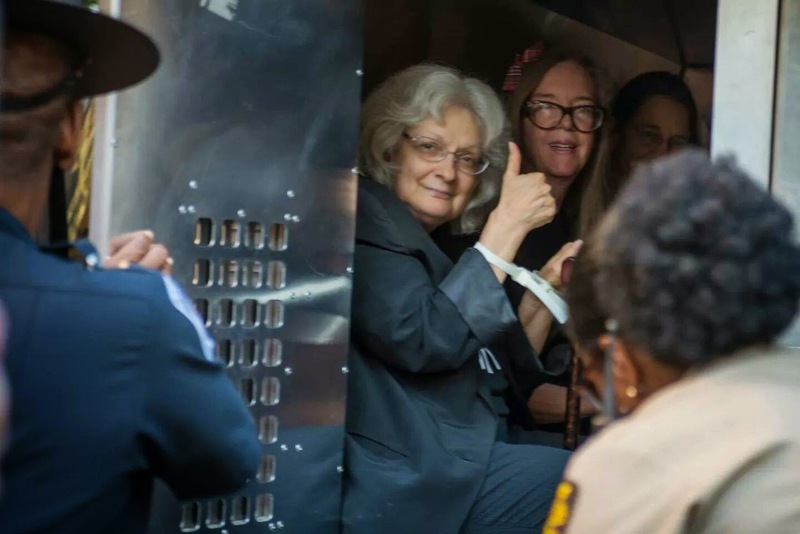 We are proud to be able to share space with the Moral Monday Georgia arrestees as their bold action shined a light on the kind of government business that is worth disrupting. 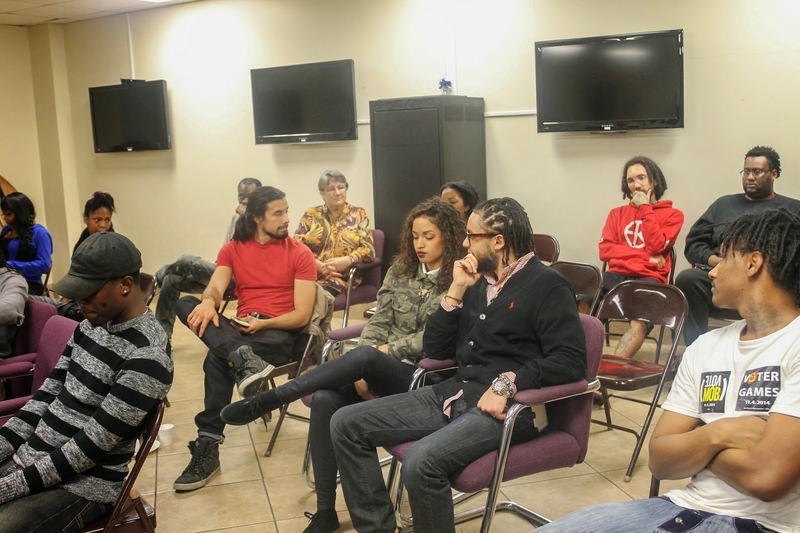 Gen Y Project chose Black Power Mixtape because we felt like this film would open peoples mind and allow folks to understand how the black community has been oppressed by the system since the birth of this country. It also points out how The Black Panther Party was governing their own communities and empowering the black community to become activist and conscience about the racist world that surrounded them back then. It was sad and heartbreaking to see how drugs destroyed our people and took their minds away from the revolution, democracy, and future of the black community. After the movie, everyone had a chance to turn in Q/A cards to discuss key events (all events was key) that touched them the most about the movie; that allowed us to have conversations around issues in our communities today, and how we can get our black communities to become more conscience about the issues that affects and oppresses our youth and young adults. 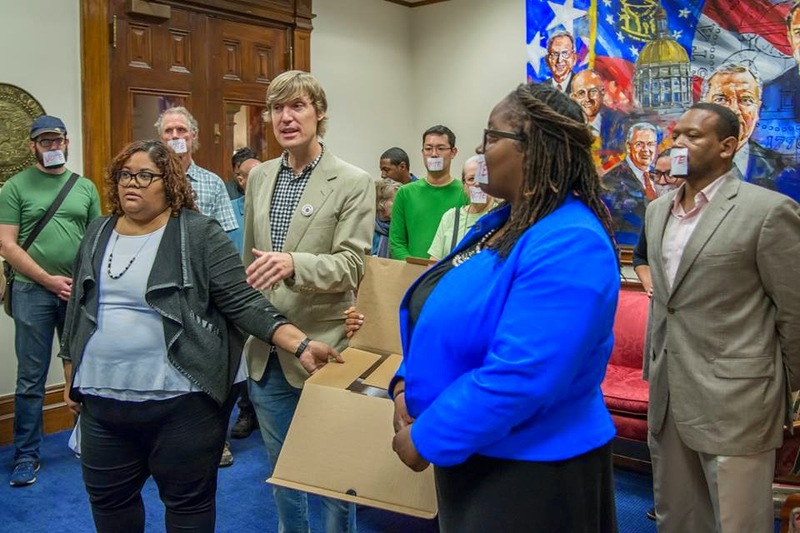 On Wednesday October 15th at Noon, members Occupy Our Homes Atlanta will gathered to deliver a petition and a giant check to Invitation Homes to demand that the company employ fair rental practices in the management of their large number of Atlanta single-family homes. For the last two years, private equity firms have been buying up foreclosed homes in various cities across the country and converting them to single family home rental properties with an eye towards securitizing the rent their tenants pay. In Atlanta, the largest investor of this kind has been The Blackstone Group, the world’s largest alternative asset private equity firm. The Blackstone Group owns companies like Sea World, The Weather Channel, and Hilton Group. Now they own thousands of houses in Metro Atlanta, and tens of thousands across the United States, through their subsidiary Invitation Homes. Nefesh Chaya signed a two-year lease with Invitation Homes so that she and her service dogs could settle into the neighborhood. She is facing eviction today because she requested reasonable repairs to a home that had been vacant for a while. Invitation Homes promised that mold removal and repairs would be complete before move in day, but they weren't, and Nefesh had to push the company to follow though. In September, Invitation Homes decided they weren’t going to spend any more money on repairs. They added the cost of a kitchen plumbing fix to Nefesh’s online bill. Invitation Homes refused to accept her rent without the disputed repair cost when she traveled to their office and then they filed an eviction. Invitation Homes acquired their Atlanta homes for pennies at foreclosure auctions, has driven up rent in the city, and are willing to threaten eviction to get more money out of Atlanta residents. Neighbors tell us that the last tenant in Nefesh’s home was pushed out this way too. 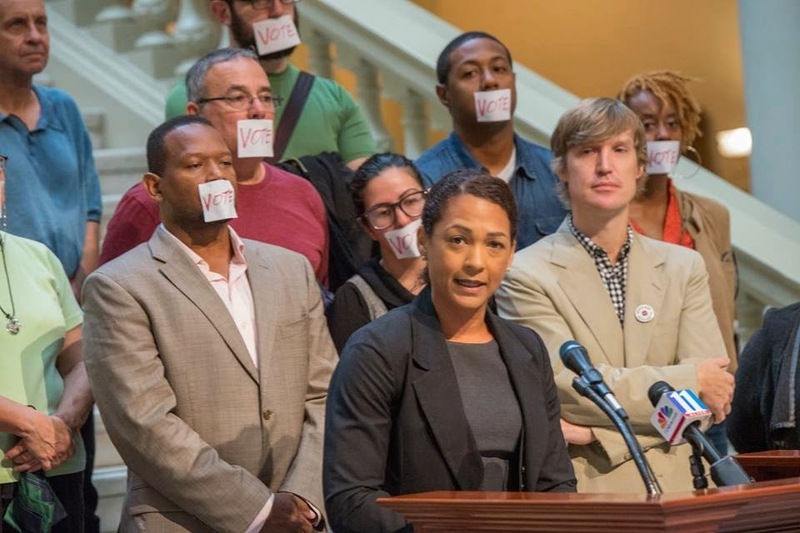 Occupy Our Homes Atlanta is concerned that Invitation Homes’ predatory rental practices undermine stability in our neighborhoods and promise to transform a large number of Atlanta single-family homes into revolving doors. As we gathered outside the building that Invitation Homes leases it was clear that the word was out on our visit as security had a rather large perimeter around the building and were actively looking for our group. 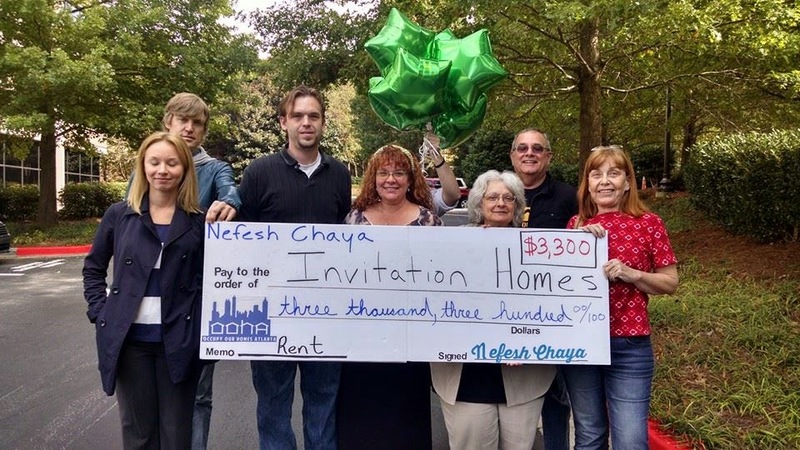 When we were spotted we made it clear that our purpose was to deliver a ceremonial check, along with real cash, and a set of festive balloons to Invitation Homes on behalf of Nefesh. The check represented the amount owed minus disputed repair fees(in Georgia repair fees are legally allowed to be disputed and are seen as a separate matter not connected to lease/rent fee). At first we were refused entry into the building and Invitation Homes refused to come down. 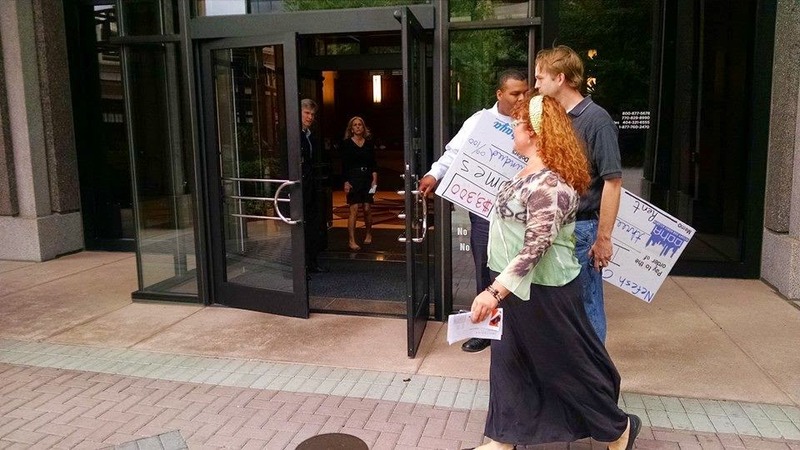 Eventually Invitation Homes Allowed two people to come up to their office where they refused to accept Nefesh’ rent money, claiming that unless she paid for the repair and added legal fees, they would proceed with a forced eviction. Nefesh has launched an online petition that we strongly encourage folks to sign and share now as she could face eviction any day now. Here is a link to video shot after the attempt to deliver the rent check was refused. Today on the second day of early voting, a delegation of folks representing a number organizations delivered over 33k petition signatures to Secretary of State Kemp’s office demanding that voters, some having registered as far back as May of this year, be added to the voter rolls. With early voting launching Monday, the Georgia Secretary of State is sitting on valid voter registrations. The most important role of the secretary of state's office is to make sure elections are fair, accessible, and secure. Processing these registration forms is not only the right thing to do — but it's also his job. Color of Change and PowerPac+, and were joined by leaders and activists from Moral Monday Georgia, including American Friends Service Committees, to insist that the Secretary of State do everything in his power to stop this latest voter suppression attempt and uphold his oath to Georgians. After making brief statements to the press we delivered the petitions to Kemp's office and demanded a response in the next 24 hours. To date Kemp's office has refused to give any reason for his refusal to add the 40k newly registered voters into the system, and he has likewise refused to meet with Moral Monday or other long standing civil rights groups like the NAACP Georgia. The fact is that this election has already started; the polls are officially open for early voting and 40k newly registered voters are being denied access to the polls. 40k is more than enough voter to through the election, which calls into question the legitimacy of Georgia’s claim to democracy. It is deeply troubling that even to the casual observer following this story it seems that Georgia’s Secretory of State is successfully attempting to block 40k people of color from having access to the polls in 2014. 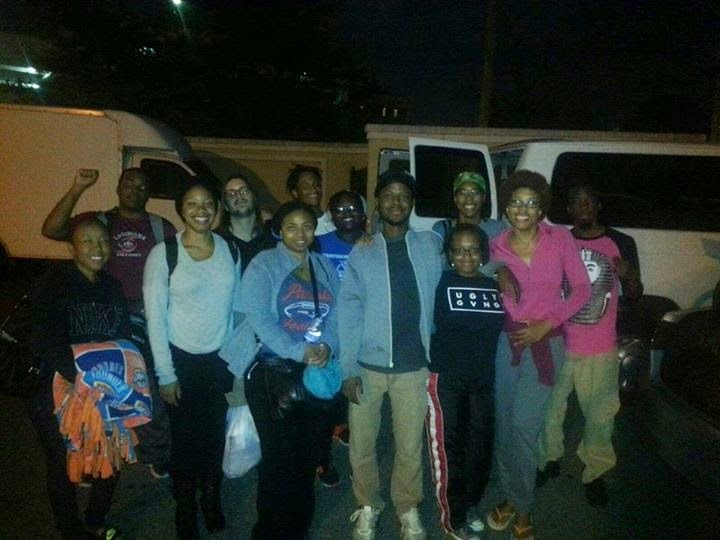 Last night a van load of Atlanta youth, organized by the newly launched Gen Y Project, began the long drive toward Ferguson, MO to participate in what organizers are calling a weekend of resistance. 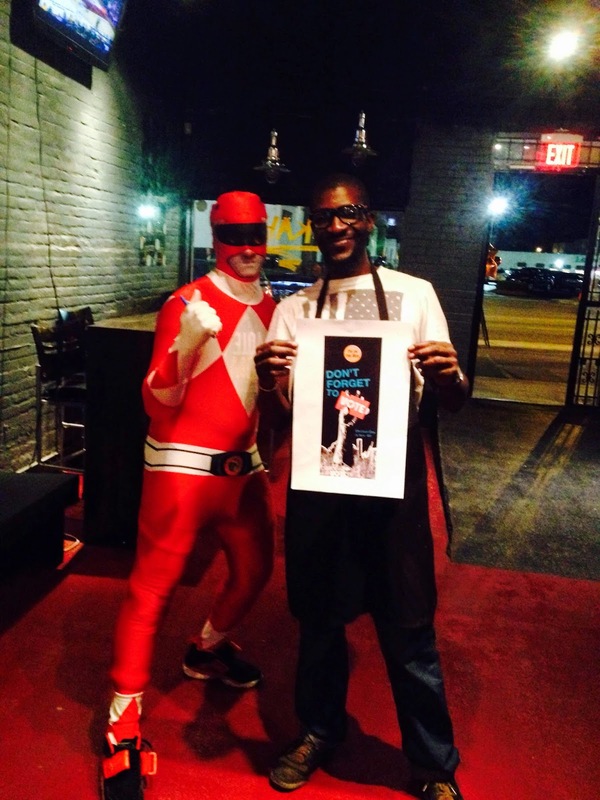 Can you pitch in a few dollars to support Atlanta Youth? The call was put out by Hands Up United, Organization For Black Struggle, Missourians Organizing for Reform and Empowerment and other partners in Ferguson. There will be a series of public events-marches, convenings, panels, concerts- to build momentum for a nationwide movement against police violence. The weekend culminates with the launch of St Louis' own Moral Monday actions, as they put it, "Power concedes nothing without a demand. On Monday, we’re taking our cue from the fearless activists in North Carolina who were inspired to fight back against right-wing attacks there and across the South. 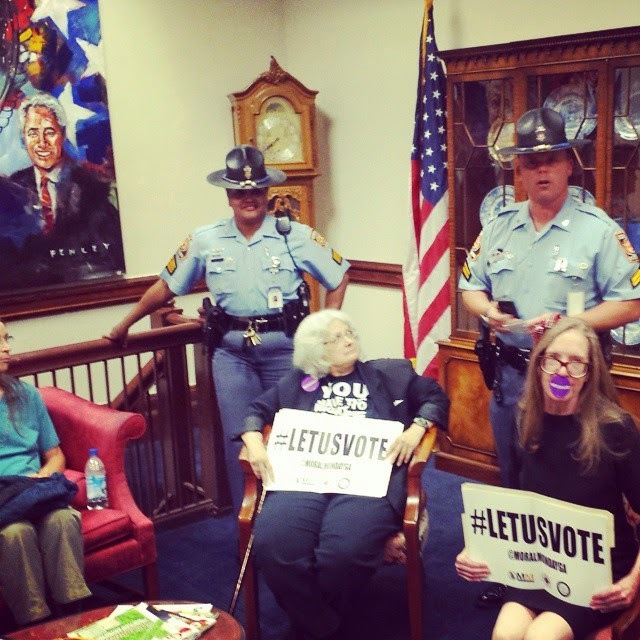 They kicked off the Moral Monday’s movement for progressive change by engaging in civil disobedience every week, reminding all of us that these actions have been a part of every major movement for change. 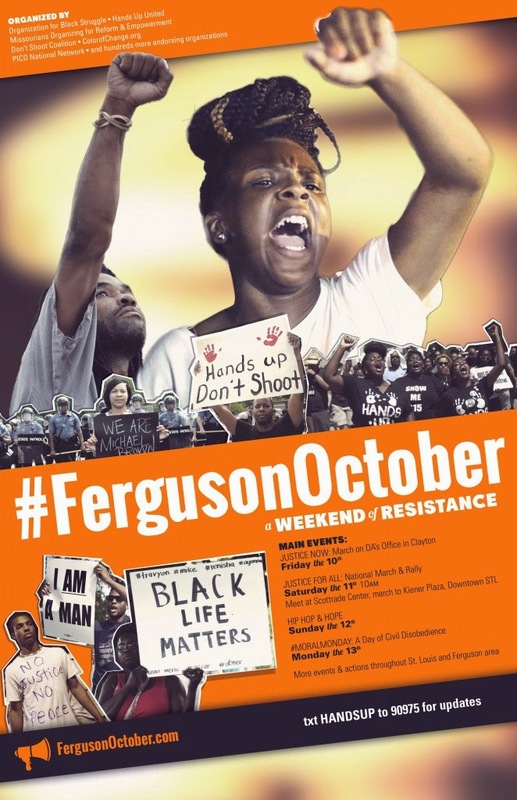 We’ll be hosting a series of actions throughout the Ferguson and St. Louis area." Can we count on you for support to make this work possible? 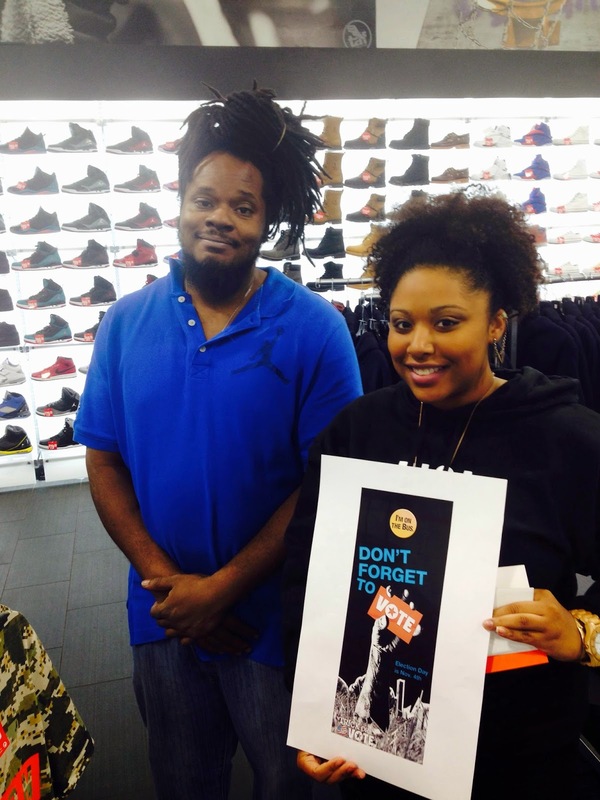 We are really excited to be able to support the Gen Y Project and even more excited to see the surge in young young people all over the country rising up in their communities against police violence. In Atlanta and beyond we are beginning to see young people transform a political moment into a youth led political movement. Organizing takes resources, and sometimes those resources can be harder to come by in youth led projects. From the van rental, gas, and lodging the costs add up. This weekend we are asking folks to show their support by investing a few dollars into this effort. Should we raise more then is needed to cover the trip we'll be excited to put it to use with other local Gen Y Projects. 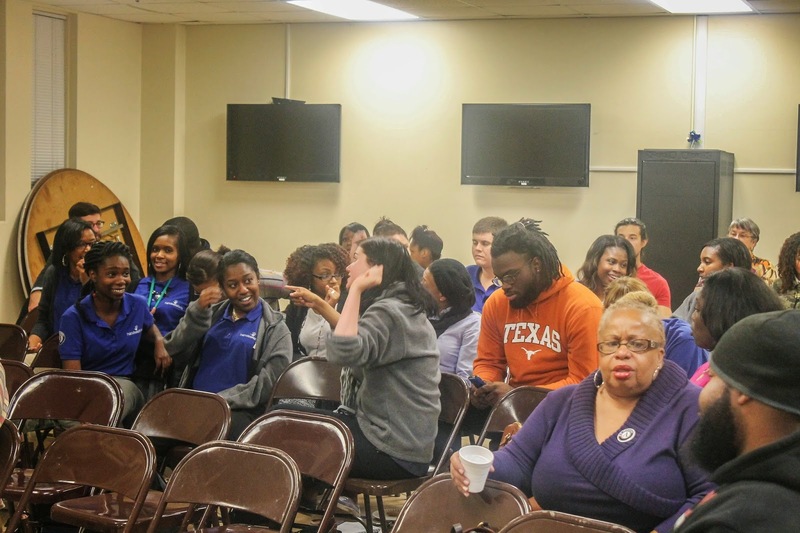 For those that want to follow our Atlanta groups trip we will be posting updates here: Gen Y Project and here: South Star News. To find out more about the Weekend of Resistance click here.